Commencement 2019 will be held on Saturday, May 11 at 9:00 AM in the Cross Insurance Arena. Come pick up your cap and gown & enter drawings to win many exciting prizes! There will be vendors and services of interest to new graduates. We will be selling unpersonalized graduation announcements in our stores and online. You can also order them directly from Balfour if you want them personalized. You can go to Balfour's website to browse options and place an order. 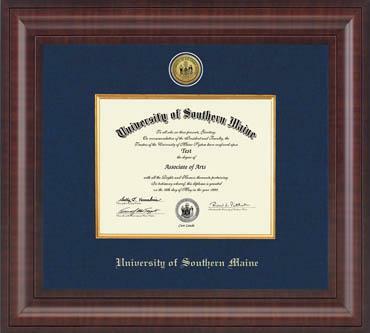 We have a great selection of University of Southern Maine and Maine School of Law Diploma frames. We also offer customization of the moulding type and matting color with Church Hill Classics. To see options, visit their website and type "University of Southern Maine" in the upper right-hand corner. Caps and Gowns will be available in the USM Bookstore April 29 - May 10. If you cannot make it into the Bookstore on the Portland campus, we can ship your regalia to your house or to the Gorham or Lewiston campus. Regalia is available to pre-order through our website but will not be charged or ready for pickup or shipping until the end of April. Please note that pre-ordering is mainly intended for graduates whose regalia is being paid for by a third party. We will have a wide range of sizes in stock and there is no need to pre-order if you are between 4'9'' and 6'8". If you are 4'9" and shorter or 6'8" and taller, please pre-order or contact us by May 4 so we can be sure to have the right gown for you. All Doctoral Graduates will be contacted individually. USM's black gowns are 'green' because each one recycles 15 plastic bottles. Please consider giving your gown to a friend to wear in the future at their graduation. We do sell hats and tassels separately if someone already has a gown. We also accept gowns back as donations to make available for future students in need. Do you need a gift to show a graduate how proud you are? Or maybe you are graduating and need a gift to thank someone for helping you along the way? For more information about Graduation (including ticketin, directions, and local accomodation info.) please visit the Commencement webpage.